This is our innovative approach to the design of a flexible, high quality and multi purpose audio mixer, based on the experience with our S120 and S340. Each channel is equipped with EELA's microprocessor control, offering flexibility to a great extend. Large push buttons are used for convenience. To meet your requirements the S130 can be equipped with mic/line modules, balanced stereo inputs with or without equalizer and telco modules. The output section can contain 4 mono groups (with high level return), and a stereo master output with compressor/limiter and 3 auxiliary sends. Each input module has a D9 channel remote control connector that can be used for extension of the operator interface or coupling to an automation system. The optional meter bridge can have PPM, or VU meters and a pre-fade listening speaker. 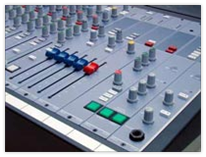 Broadcast version of the S130 with Scriptspace and Studio monitor module with separate talkback buttons for Presenter and Guest. The S130 On Air has 3 main busses to allow for studio feed and a special off-air recording bus. The meterbridge has been extended with special On-Air signalling.